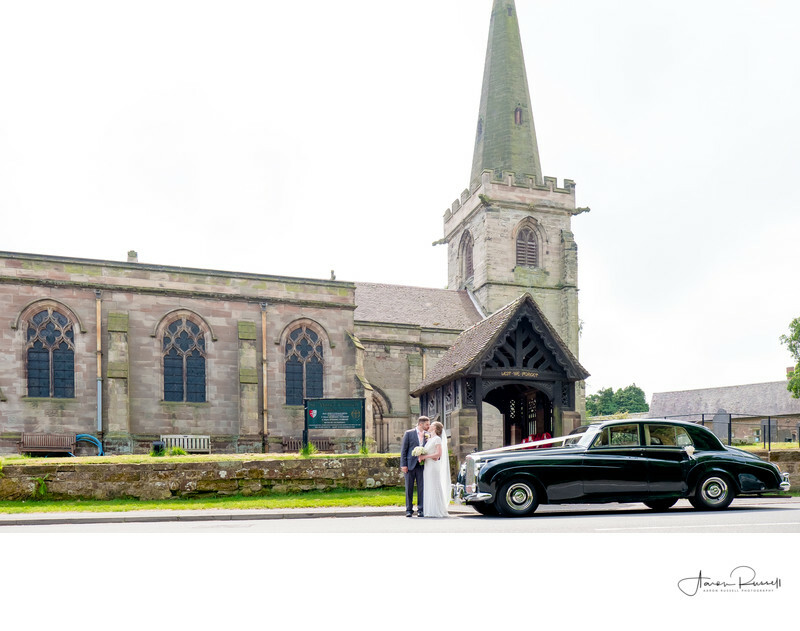 Rolleston on Dove Church in Staffordshire was the scene for Charlotte and Andrew's wedding ceremony. The church in Stafforshire is absolutely stunning and I feel honoured to have been asked to be their wedding photographer on their momentous day. The weather for their wedding could not have been better and as soon as we exited the church after the ceremony, I immediately knew that I wanted to make use of the good conditions and get the photo you see here. In order for this to work, I had to wait for all of the guests to have left in order that I got the completely clear background that I had hoped for. Don't get me wrong, in most of my wedding photos the guests are the stars of the show (after the bride and groom, natrually) but here I wanted to show an intimate moment with the newlyweds. I asked the driver of the wedding car to bring the vehicle around the corner and onto this stretch of road. I then carefully positioned the car, as well as the bride and groom in such a way that I could see them all well, but also at the same time using them to help frame the church in the photo. The main problem I actually faced was waiting for the road to be clear of other vehicles! The sun was ideally placed too for this photo, being behind the couple as I looked at them. This meant that their faces were free from direct sunlight (which causes harsh shadows as well as making people squint) which gave a gorgeous rim-lighting effect to the couple, helping to lift them away from the background. The sunlight coming through the bride's dress and veil are added bonuses that all go together to really make this image work.